June 15 is the rumored launch date of the upcoming OnePlus 5 which is in the news for quite a few months now. 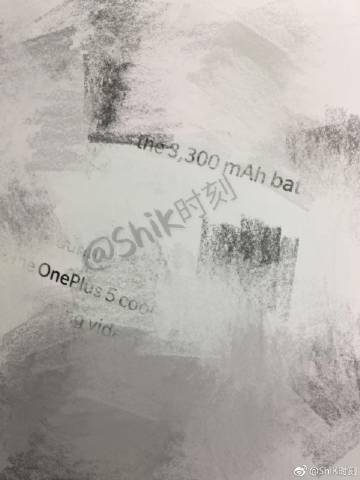 Some features of the phone that are already known include a Snapdragon 835 processor, front-facing fingerprint scanner, headphone jack on the top, dual camera setup on the rear, 6 or 8GB of RAM and a slightly smaller body than the OnePlus 3T.Today, we came to know via Weibo that the phone has got a 3,300mAh battery under the hood, which is larger than the 3,000mAh of OnePlus 3 and smaller than the 3,500mAh battery of the OnePlus 3T. The Phone is going to be the thinnest flagship smartphone as per the CEO so, it makes sense why the company planned to make the battery smaller than its previous flagship. Also, Pete Lau, the CEO of OnePlus, has said that reducing the thickness doesn’t mean sacrificing the user experience. So, the chances are that the company has optimized the software on the OnePlus 5 to give the most out of the 3,300mAh battery. We saw the same thing on the Moto Z2 Play that launched today as it has a smaller battery than the last year’s Moto Z Play which is a battery beast. Do you think a smaller battery size means less battery life? Do let us know via the comments section.